We have several small filter cartridges that remove iron, but for most large applications, we don't recommend them. If you're filling a full-sized swimming pool with well water that contains iron, a small garden hose filter is not a reasonable alternative. If you were treating the same water for a home with an iron filter, a common filter size would be 10" to 12" in diameter and almost 6 feet tall. Even with this size advantage, the filter would need to “backwash” to clean itself of the iron it had removed virtually every day. 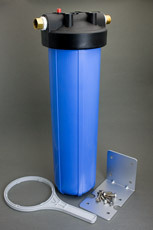 It isn't reasonable to expect at tiny 2.5" X 9.75" filter cartridge, with no way to clean itself of stored iron, to treat more than a few gallons of water. A garden hose filter with a Birm or Filox cartridge might work out for you if you're filling a relatively small hot tub and you're willing to change the cartridge frequently, but for a 10,000 gallon swimming pool you'll need the help of a pool or water treatment professional. If you're really serious about removing iron from a large amount of water with a garden hose and you're willing to spend some money on it, consider the largest size garden hose filter (GH400) with Pentek's 4.5" X 20" iron removal cartridge (FC410). Standard size garden hose filters. 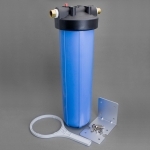 Larger garden hose filters with higher flow rates and greater filtration capacity. 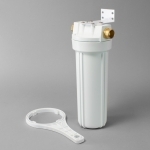 Washer Machine Filters for cold and hot water sediment removal for your washer.